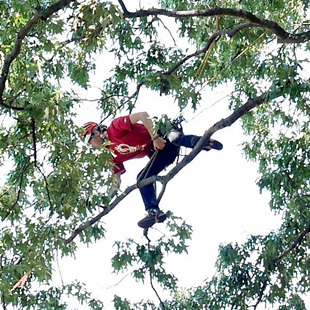 As a competitive sport, tree-climbing lacks the haphazard triumphs and panics of childhood exploits in a backyard maple. In their winning climbs in D.C. this past weekend, Chrissie Spence (above) and James Kilpatrick (below) moved more like action-geek rock climbers or Tom Cruise movie heroes. The two New Zealanders employed ingenious gear and strategies with prodigious strength and discipline. 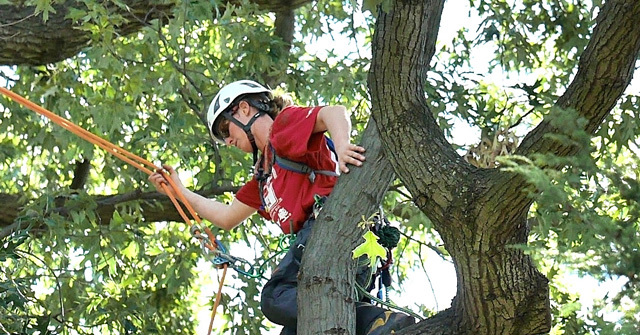 Completing numerous tests within the alloted 33 minutes, Kilpatrick and Spence became the 2017 men’s and women’s champs of the International Tree-Climbing Championship, repeating their wins from 2016. 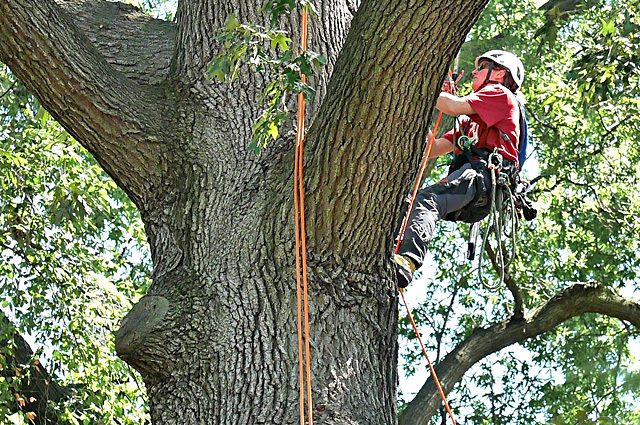 Everywhere in a massive red oak at the National Arboretum, the finalists tossed, strung and adjusted ropes. 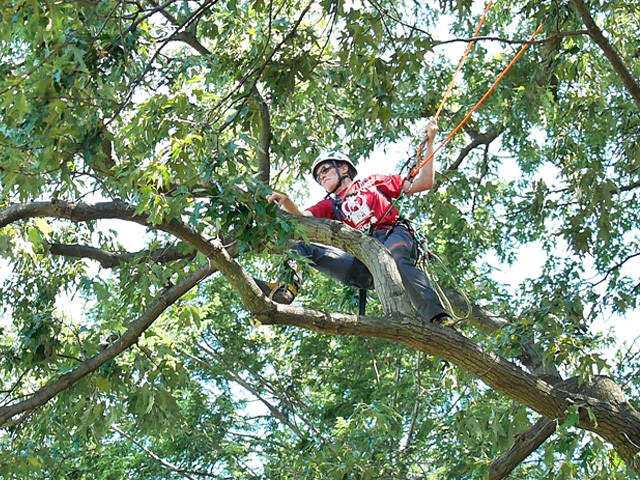 International Society of Arboriculture safety regulations governed every move. Contestants could be is qualified for holding handsaws in their mouths, for detaching their safety lines, or for merely falling out of the tree. In their most suspenseful maneuvers, these climbers (Kilpatrick at left) inched out on sagging limbs as if they were rescuing imaginary cats or children. Dozens of spectators, expert and civilian, shouted encouragement. Judges clocked each task while a big digital readout counted down the elapsed time. 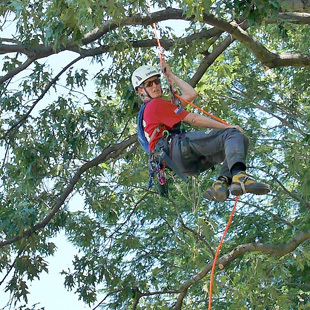 Before the 33-minute time limit expired, they zipped earthward, leaving no traces of climbing gear or of their scrambles up, around and down the tree. Before the championship round, Carmel Delshad, a producer at WAMU, tried her own climbing aptitude for a soft first-person feature. 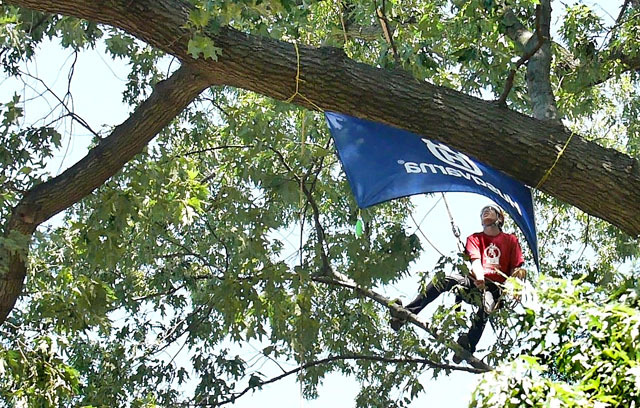 A slogan of the International Society of Arboriculture (at right) borrows from successful past campaigns such as Christians Are Good, Milk Is Good, and Gay Is Good.